If there’s anybody in line to fight Anthony Joshua following the British heavyweight’s unification bout against Joseph Parker, it’s either Deontay Wilder or Jarrell Miller. Joshua’s promoter Eddie Hearn has said that a unification bout for the undisputed title is likely against Deontay Wilder later this year. It’s also being said that if the fight doesn’t materialize, he would make his US debut against Miller. All of a sudden, however, Hearn has revealed that Joshua could be in for a rematch with Dillian Whyte. 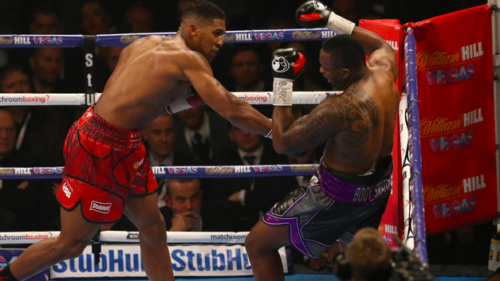 Joshua stopped Whyte in the 7th round when they traded punches in December 2015. And for the rematch to happen, Whyte needs to win his March 24 fight for the WBC silver belt against the unbeaten Lucas Browne. “I know that Joshua will fight Dillian Whyte again,” Hearn told Sky Sports in an exclusive interview. “I think if you asked him and said ‘Tell me one fight in the division you want?’ He could say Dillian Whyte, because he loved it, and he feels as though he wasn’t his best, because he lost his rag a little bit. Joshua will take on Parker come March 31 in Cardiff.